The final vote is 6-1 in favor of the controversial ordinance, which may be challenged in court or at the polls in the fall. SOUTH PORTLAND — The City Council gave final approval Monday night to controversial zoning changes that are expected to block the potential export of Canadian tar sands oil from the city’s waterfront. The South Portland Community Center gym erupted with cheers and applause when the council voted 6-1 in favor of a ban that may soon be challenged in court and at the ballot box if opponents move forward with threats of a lawsuit and a citizen-initiated referendum. “If you fight this in court, you will lose,” Blake said, before voting to approve the ban along with councilors Linda Cohen, Patricia Smith, Melissa Linscott, Maxine Beecher and Mayor Jerry Jalbert. Councilor Michael Pock provided the sole vote against the changes, after offering an unsuccessful amendment to limit the ban to “non-American crude oil.” Blake and Smith scolded Pock for his last-minute action before the council rejected his amendment 6-1. The council unanimously postponed acting to repeal a moratorium on development related to exports of tar sands oil. The council wants the moratorium, enacted last November, to remain in effect through the summer because opponents have indicated they are considering gathering signatures for a November referendum to overturn the ban, Jalbert said. The opponents have 20 days to collect and submit the signatures of at least 950 registered city voters. The council had already signaled its preliminary approval with a 6-1 vote on July 9. Nearly 500 people turned out for that meeting, many wearing light blue or red T-shirts in support of or opposition to the changes. Monday night, only the light blue T-shirts of supporters were apparent. The Planning Board voted 6-1 last week to recommend the zoning proposal, which aims to prevent the bulk loading of crude oil, including tar sands, onto marine tank vessels and block construction or expansion of terminals and other facilities for that purpose. Supporters of the ban hugged and congratulated one another after the vote. 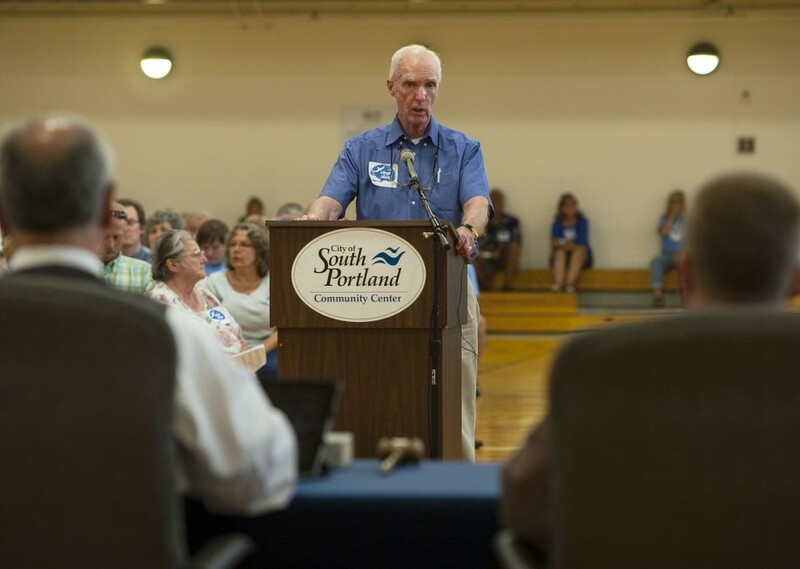 Opponents – including Tom Hardison, vice president of the Portland Pipe Line Corp. – were disappointed but not surprised that the ban passed. Tar sands oil is a heavy crude mixed with sand that is abundant in Alberta in western Canada. Global oil companies are working to create routes for exporting the oil, including the Keystone pipeline complex that would stretch from Canada through the United States to the Gulf of Mexico. While there is no active proposal to export tar sands oil through Maine, environmentalists fear the oil companies may one day reverse the 236-mile Portland-Montreal Pipe Line, which currently transports crude oil from South Portland to Canada. The ordinance changes approved Monday were developed by the Draft Ordinance Committee after city voters rejected a much broader Waterfront Protection Ordinance by a 200-vote margin in November. In developing its follow-up proposal, the ordinance committee found that loading crude oil onto a ship could increase air pollution, and that the vapor combustion facilities needed to mitigate the problem would have a negative visual impact on the waterfront. Environmentalists want to block the export of Canada’s tar sands oil because of its potential to contribute to global climate change. They also argue it is difficult to clean if spilled and that export operations would add air pollution to the local environment. “We must do everything we can to improve our air quality,” said Judith Moll, a Fort Road resident who spoke during more than two hours of testimony heard by the council. Oil industry employees and representatives, including the Maine Energy Marketers Association, dispute those claims, saying that any restrictions are unjustified and would constrain business development, jeopardize jobs and block future crude exports. It’s currently illegal to export U.S. crude oil, with some exceptions. The ban approved Monday wouldn’t affect current uses or the handling of gasoline, diesel, biodiesel, ethanol, kerosene, No. 2 fuel oil, jet fuel, aviation gasoline, home heating oil, asphalt, distillate, waste oil, lubricants or other refined petroleum products.